CWO is an Estate Winery. We offer 10 varieties of wine, along with our Extra Virgin Olive Oil. 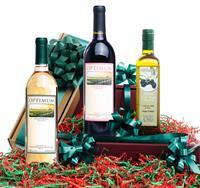 Free Personalized labels available on our Wine & Olive Oil with purchase. CWO is located along Hwy 99 in Pixley CA, off of Avenue 96 on the east side of the Hwy. We are 20 minutes south of Tulare and 45 minutes north of Bakersfield.